So you feel like you need to lose a few pounds. That means you need to decide which diet will help the most and in the quickest amount of time, right? Since there are so many weight loss options to choose from, you might find yourself overwhelmed. Walk down a particular aisle in the grocery store, and you’ll see different pills and drinks. If you watch any amount of TV, you’ve seen commercials or infomercials about the best weight loss solution created by a doctor who knows, and they usually include real testimonies from real people with before and after pictures. Then, there are the infinite diets that only focus on food. Which one do you pick? Let’s take a quick look into each of these options and see which works best for you. Pills: Here’s my question to you about weight loss pills. Don’t you think if you could lose a substantial amount of weight simply by swallowing a magic pill without doing anything else, not only would a lot of gyms and all weight loss centers shut down, but it probably wouldn’t be sold for $14.99 on aisle 3 of your favorite grocery store, right? Don’t feel bad for being fooled by all of the research and statistics written on the bottle. It’s even easier to fall for it when you see something that has a picture of a celebrity trainer on the front. I’ve been fooled too. That’s why those pills sell so well is because they know many people will be fooled. Drinks: Ahh the weight loss drink. Whether it comes in the form of water with added “stuff” or shakes to replace meals, there are so many to choose from. Drinks that are marketed as healthy sports drinks, water with extra weight loss something or other added, or even sodas marketed as diet aren’t created to be your only means of losing weight. Don’t get me wrong. I’m not saying they’re bad and don’t ever drink them because that’s completely your call. I’m saying you shouldn’t depend on them to bring you down to your desired weight. Drinks like these, thought, are loaded with some type of sugar. Don’t be fooled with the big print that says it contains no sugar. Instead it has a sweetener or artificial sweetener. This means sugar people! J Regardless of the way it came to be, it’s all sugar, and the diet drinks sometimes carry as much as a soda, so be careful when adding them to your everyday meal plan. Then, we have the shakes. I remember trying them when I was overweight years ago. What happened? I was starving! By the time I got to eat a meal at dinner, I ate all three meals in one until I felt like I would explode. It actually had reverse results for me because I was eating so much in one sitting, and our bodies weren’t created to starve for the majority of the day and then be stuffed – even if the foods are healthy. Frozen Meals: Quick note about the frozen weight loss meals-look closely at the sodium. Sodium creates water retention and bloating. There’s no reason that a tiny meal that tastes awful and leaves you hungry should have 550 mg of sodium! Sure, they’re low in calories, but sometimes high sodium is worse for your weight. It’s so easy to fall into the traps of these companies because most show celebrity endorsements and amazing before and after pictures from “real” people. Have you ever looked at the teeny tiny print at the bottom of the package or TV screen? It says *Results not typical. It really does say that! Even the makers tell you up front that it’s not likely you’ll see the results they’re advertising. And those celebrities pay a lot of money for personal trainers to go along with whatever they’re endorsing. Let’s nix these ideas and look onto real dieting. There are so many to choose from, though, so I’ll break it down and tell you the one and only diet that works 100% of the time. After family, friends, and I have tried many different diets, I’ve found what works! First, there are some diets and “magic potions” that I’ve seen work amazingly. I’ve seen sizes drop dramatically. Here’s what else I saw from those particular diets: we were always hungry or felt deprived of food we wanted AND as soon as the diet stopped, the weight came back as quickly as it left. All of that deprivation was for nothing, and this is true for most, if not all, diets. 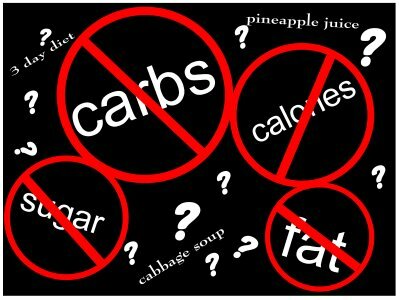 Tip of the Week: Don’t Diet!!! I wrote everything above just to get you to this point – Diets are not good for you and do NOT work! This includes pills, drinks, meals, etc. They just don’t work and to be honest, they aren’t good for you. The only diet that is 100% effective is not a diet like you think of when you hear that word. It’s having a healthy diet as a part of your lifestyle. Diet means food you eat – NOT means of losing weight. Including a healthy diet as a part of your lifestyle should never make you feel deprived of your favorite foods, and you should never feel hungry. When your regular diet is healthy and not something you do here and there for a couple of weeks, you should not feel a single bit of guilt when you have “junk food” or dessert every so often. Just keep it in moderation. So . . . the best diet you can choose is a healthy, balanced daily diet that fits your lifestyle. Don’t do it to lose weight. Do it to be healthy. Your heart will thank you. Those diets cause a lot of stress on your heart, and no amount of weight loss is worth that type of stress to your most vital organ. Quickie Quick Testimony: When I started cooking my own meals, using fresh vegetables and eliminated boxed and canned foods, I lost about 25 pounds over a period of several months. At that time I was probably about 30 pounds overweight, so that alone brought me back to a healthy size. Two years ago, my husband took sodas out of his diet and decided to say no to desserts that are always offered at the office, and he lost 30 pounds over a period of several months! Now, we both still enjoy our sweets every so often and our junk food (pizza is a weakness), and he has a soda every now and then, but our healthy eating habits make it okay to indulge sometime . I changed my habits about 10 years ago and never gained that weight back, and he has kept his off for the past 2 years. It can be done, but please make sure your goal is a healthy weight and not something the latest actress says she is. Hollywood numbers are very different from real life numbers.